Alexander Evelyn Michael Waugh (born 1963) is an English businessman, writer, critic, journalist, composer, cartoonist, record producer and television presenter. He is best known for his biography of the Wittgenstein family (The House of Wittgenstein: A Family at War) published in 2009. He is a founding director and Chairman of Xebras Management Ltd, the digital media company. He has also served on the boards of Concert Agency, Manygate Management Ltd, and of the award winning Travelman Publishing Ltd. He is currently an independent Non-Executive Director of Millennium & Copthorne Hotels plc and Chairman of the Remuneration Committee. He is the grandson of Evelyn Waugh, the eldest son of Auberon Waugh, and the brother of Daisy Waugh. He was educated at Taunton School, the University of Manchester and the University of Surrey, where he gained degrees in Music. Alexander Waugh was the chief opera critic of the Mail on Sunday (1990–91) and of The Evening Standard (1991-1996). His books on music include Classical Music: A New Way of Listening (1995) and Opera: A New Way of Listening (1996). He reviews non-fiction books for the British press and has contributed cartoons to The Literary Review and The Daily Telegraph. His books Time (1999) and God (2002) use irony and wit to impart a considerable amount of condensed information. His biography Fathers and Sons (2004) is a portrait of the male relations across five generations in his own family. It was made into 90-minute BBC documentary film in 2005. In 2006 he presented the BBC television documentary. His theatre piece Bon Voyage! (co-written with his brother Nathaniel Waugh) won the 12th Vivian Ellis Award for Best New Musical. As a classical record producer he has been responsible for a host of prize-winning discs including five MRA Awards and a French Grand Prix du Disque. He is General Editor of the 42-volume scholarly edition, the Complete Works of Evelyn Waugh, shortly to be published by Oxford University Press, and is a member of International Digital Publishing Forum and of the Academy, Beefsteak and Chelsea Arts Clubs in London. Waugh is an advocate of the Oxfordian theory, the belief that Edward de Vere, 17th Earl of Oxford wrote the works of William Shakespeare. He claims to have found surreptitious allusions embedded in 16th- and 17th-century works revealing that the name "William Shakespeare" was a pseudonym used by Oxford to write the Shakespeare oeuvre. He is a life member of the De Vere Society,  and serves as the Honorary President of the Shakespeare Authorship Coalition. “Waugh on Jonson’s ‘Sweet Swan of Avon’” The Oxfordian 16 (2014): 97-103. ↑ "The Piano – A Love Affair"
↑ Waugh, Alexander. (2 November 2013) "Shakespeare was a nom de plume—get over it". The Spectator. ↑ Waugh, Alexander. "John Weever - Another Anti-Stratfordian," De Vere Society Newsletter, 21: 2 (May 2014), pp. 12-15. ↑ "Alexander Waugh joins the De Vere Society". De Vere Society Newsletter, October 2013. ↑ "About the SAC". 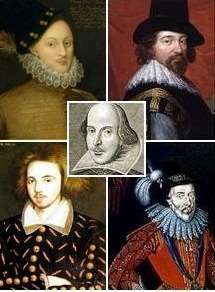 The Shakespeare Authorship Coalition. Retrieved 13 April 2015. The Daily Telegraph, July 17, 1998, "Light Reading on the 6.15: Alexander Waugh tells Eliza Charlton about his publishing brainwave - the short story that folds like a map"